Police in Maine are investigating after a dog was apparently shot, killed and dumped over an embankment. The dog, described as either a male pit bull or an American bulldog, was found off Route 108 in Peru. According to Maine Lost Dog Recovery, the dog was about two-years-old, and weighed around 55 pounds. He was primarly black with white toes and feet, and distinctive white markings around his head and neck. 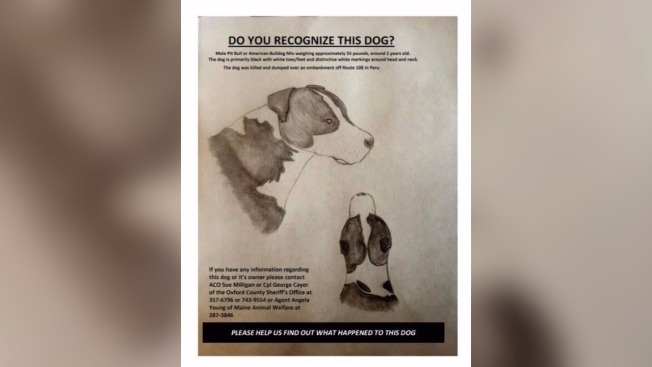 The search is on to find the dog's owner. If anyone has information, you are asked to call: (207) 357-6796 or (207) 287-3846.